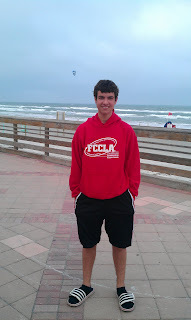 New Smyrna Beach (NSB) was the beach everyone went to when I was in high school to hang out. We always met at the "mafia house." I don't remember the whole story behind this house, but it was huge and half finished. We'd park on the beach, play volleyball or football and just people watch. The area has grown since I was a kid, but it's growth is nothing compared to Daytona Beach! One of the great things about NSB now is crossing over on the North Causeway, and driving through the quaint "old town" strip just before you get to the beach. 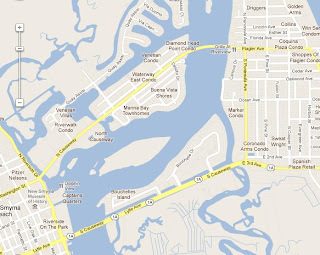 Most people get to NSB by heading east on 44 from I-4. If you stay on 44 all the way to the beach you'll miss this little shopping area. You have to turn left on Riverside Drive just before you head over the South Causeway (don't go over the big bridge!). Head north about 5 blocks and then turn right onto North Causeway. This points you straight toward the beach - via shopping and dining! There are dozens of shops and restaurants to stroll through. It's a neat little area! As you come to the end of this strip the road runs right down onto the beach. There are plenty of places to stay in NSB, and being able to drive right on the beach is a big plus! I took these pictures in December, and the weather was still fairly nice. There were a few people in the water. The wind was really blowing, which made everything hazy. The wind did seem to help out this kite surfer. The birds didn't seem too happy about the weather. They just hung out in groups and pouted! As always, we enjoyed our day at the beach - regardless of the weather. New Smyrna Beach is always a great place to go with plenty of things to do!